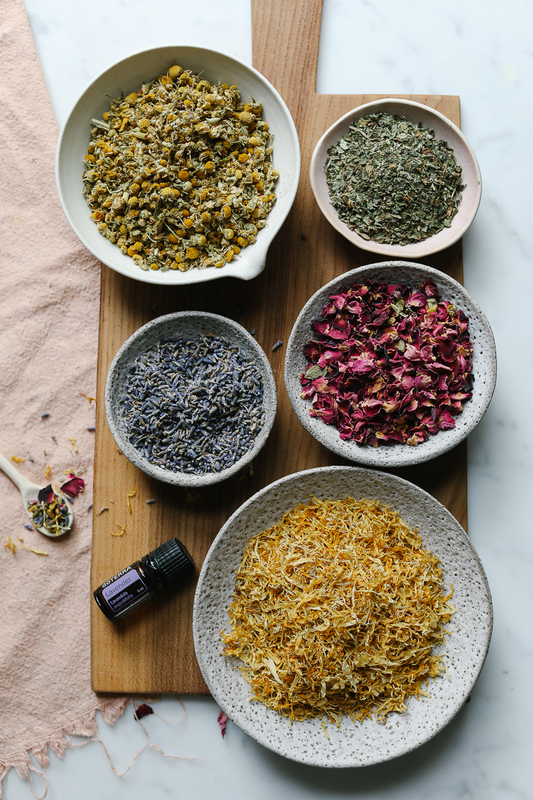 A few weeks ago I saw a beautiful, botanical facial steam at a store in Boston and decided to try and whip up my own at home. The result was so simple, inexpensive and delightful that I decided to share it here on the blog. With the holidays coming up, (I know, it's only October) I wanted to develop this "recipe" so that I could make some for my friends and family as stocking stuffers and gifts. After a quick trip to the Harvest Co-op in Jamaica Plain, I had all of the ingredients ready to go. I already had rose petals in my spice cabinet from when I made these popsicles, so I knew I only needed a few more organic herbs to blend in my aromatic facial steam. All of the herbs were available in the bulk aisle at my co-op but any natural market that sells herbs in bulk should have them. Gently stir together 2 TBS of each herb and a tiny drop of lavender essential oil. This will give you roughly 10 TBS of blended herbs. 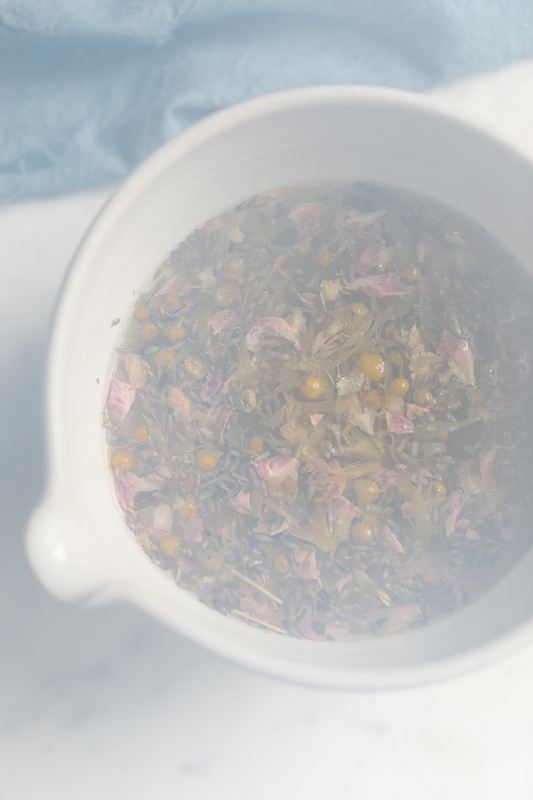 Each facial steam requires 2 TBS, so you'll have roughly 5 "servings". You can scale this recipe up or down depending on the desired quantity. I bought about 2 cups of each herb to play around with, but you could buy less or more. 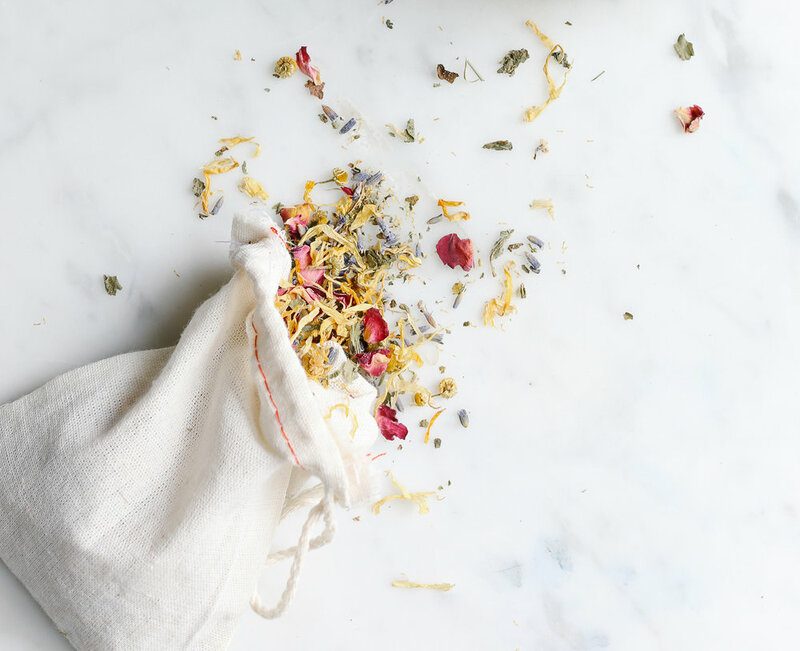 Blending the herbs in equal parts will give you a balanced and beautiful facial steam. Bring 2 cups of filtered water to a boil and pour it into a heat proof bowl. Add 2 TBS of the blended facial steam herbs and stir. Allow it to cool for a minute or two. (you don't want to burn yourself getting too close to the steam right away) Carefully put your face about 6-10 inches over the steam and drape a towel over your head to make a tent and capture the steam. Enjoy the steam and take some deep breaths for a few minutes while the steam opens your pores, purifies your skin and relaxes you. Store the remaining herbs in a cloth bag like these. I used an old jewelry pouch making this entire project zero-waste! I followed the steam with a clay mask and my skin felt amazing afterward. This is definitely making its way into my self-care routine! Hope you enjoy this! Let me know if you make it and try it. You can always buy one if you don't feel like doing it yourself. Do you ever steam your face?